Well after a bitterly cold few weeks courtesy of The Beast from The East, it’s finally beginning to feel a little more like spring. I know it’s not that unusual to have the odd flurry of snow in March, but it’s rare to have sub-zero temperatures day after day. However, the clocks go forward this weekend and I’m looking forward to a day out with Poppy and her friend tomorrow for her 17th birthday. I’m ready to dress for spring. This black and white outfit with red boots and bee jewellery is what I wore last night for another birthday celebration. That of my wonderful friend Sally, (not the same Sally who’s fiftieth I wore the statement green and pink skirt for two weeks ago, although she’s an equally wonderful friend and was there too last night!) 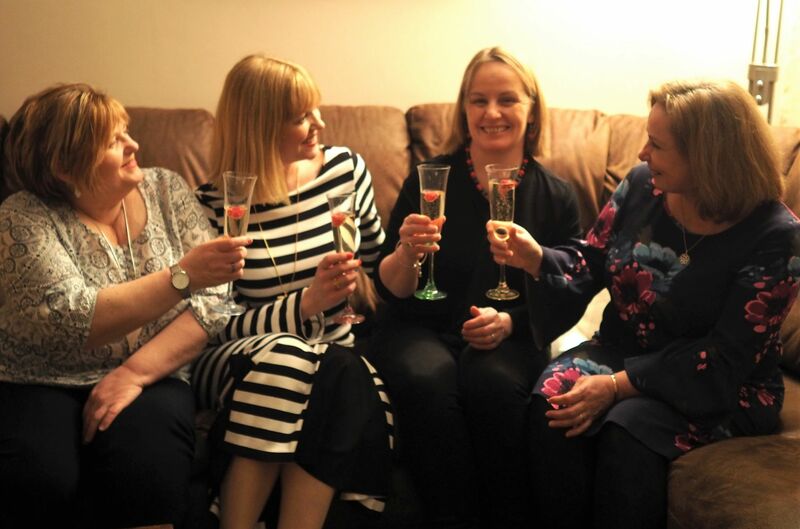 I have a very close group of fabulous girlfriends here in Skipton and we went to Sally’s house armed with fizz and flowers and spent the evening laughing, catching up and generally putting the world to rights. You might remember this black and white striped godet dress from this time last year. It’s one of my favourite dresses and draws compliments every time I wear it. As well as that, it’s comfortable and it doesn’t crease. I’ve worn it over and over and it still looks like new. I enjoy wearing it and love the style details: the black godets, the extra long sleeves and the back zip. I have always had a thing about bees. 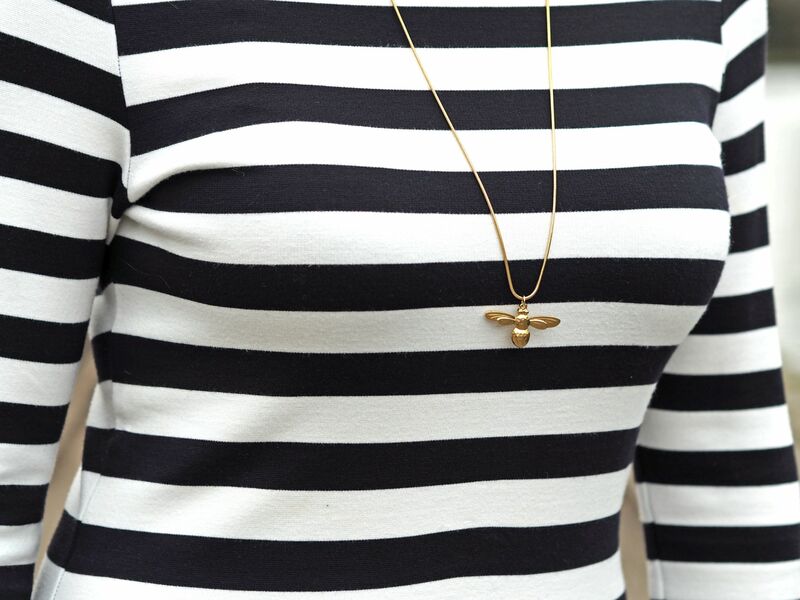 I don’t know why that should be, but I’m always drawn to bee prints, fabrics and jewellery. 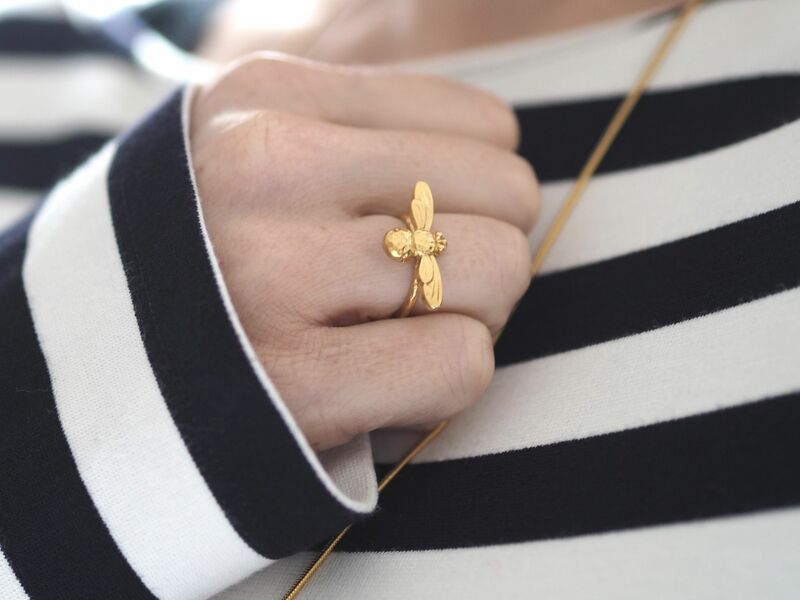 This honey bee jewellery is by Israeli artisan brand, Danon. It’s available in silver too and I stock it in my jewellery boutique. I adore the warm tones of the gold though, especially in spring and summer. 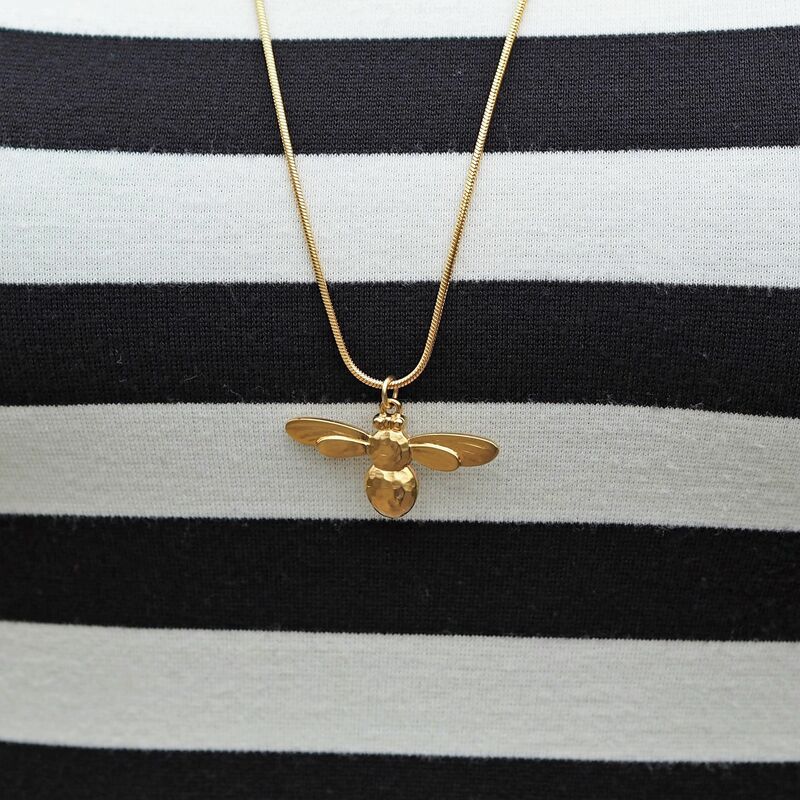 It’s bee-autifully made and easy on the eye; I love the length of the necklace, but it comes in a shorter mini version too. We had a wonderful night at Sally’s house. I’ve mentioned these girls a few times on my blog. They are always there and we never stop laughing and sharing. Sue on the left took me to hospital for my hysteroscopy. She also has a goalkeeper son and takes them about two-thirds of the time to their training session, an hour’s drive away on a Friday evening. I do the other third. Sally C, sitting next to me, whose birthday it was took me when I had the minor op on my nose two weeks ago. 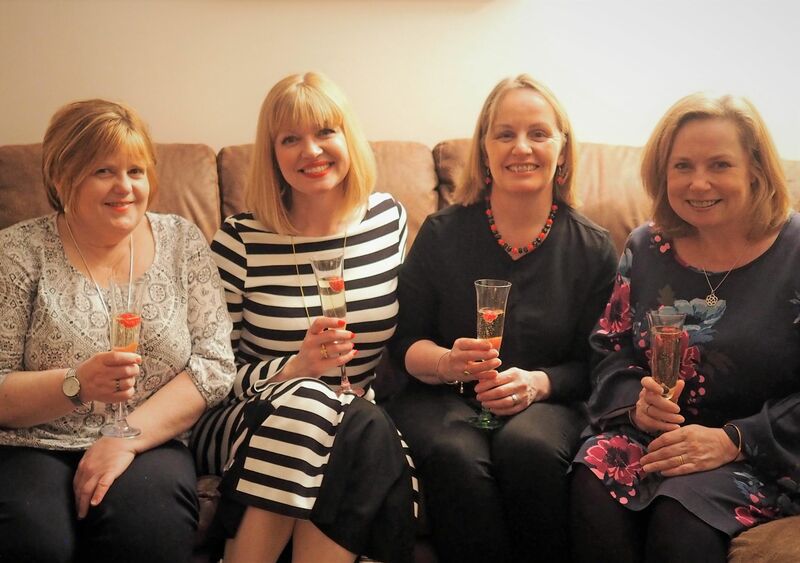 And it was the other Sally, Sally B, far right, whose 50th birthday party I went to three weeks ago. Our fabulous Italian friend Barbara cam later after a day of travelling but she too is such a huge part of my life. I love their company and I feel very blessed to have them in my life. And look, Sally wore red boots too. Thank you to everyone who commented on my previous post about my hysteroscopy. It was very honest and open and one I thought long and hard about writing. It seems to have resonated with a lot of women and it’s served to highlight just how many of us suffer, (and we do suffer), because of mennorhagia. Thank you for your lovely feedback, concern and well-wishes, but most of all, thank you for sharing your stories too. I hope if nothing else, it will reassure that there are procedures, protocols and potential solutions in place. My dress was a gift from Finery London last year and the red kitten heel boots were a gift from F&F Clothing earlier this year. This isn't a sponsored post. Everything is 100% honest and all content is my own. Thank you for supporting the brands that support my blog and thank you Poppy for taking the photographs. Next Post The Boden Sale, Spring 2018. My Favourite Picks. Wow ! I love the outfit. It is stunning on you. 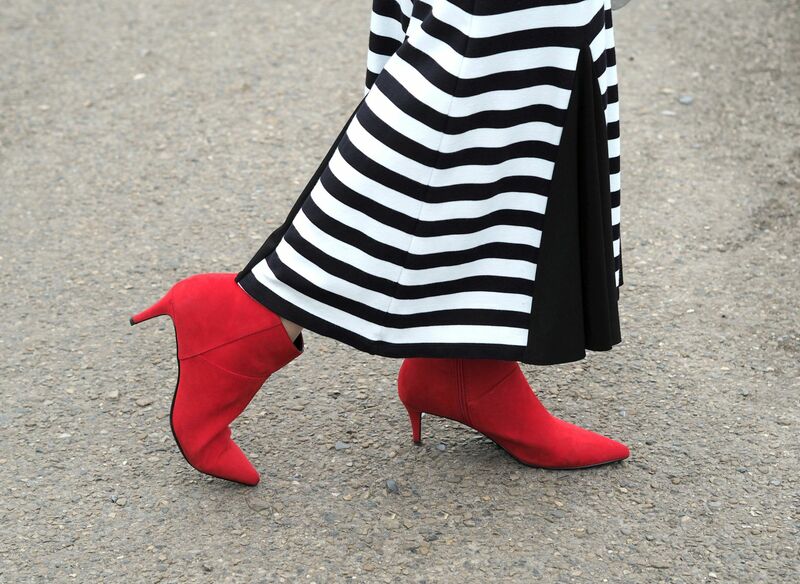 The pop of colour in those boots is just FABULOUS ! I’d love to see you wear that dress in the summer (or if you travel somewhere tropical-ish) with a pair of flip-flops. Such a gorgeous dress – so flattering for your utterly perfect figure Lizzy! 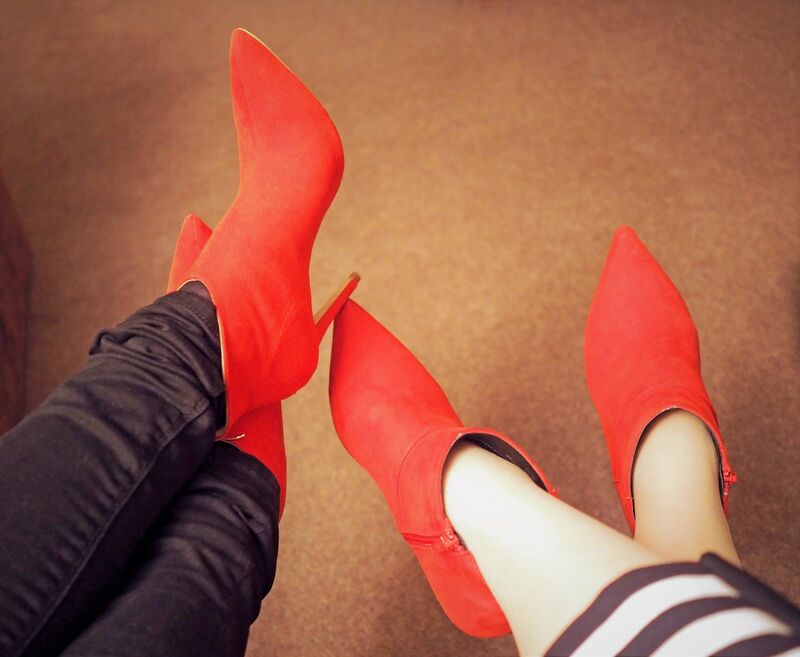 And red boots seem to be the footwear of the moment.